Well I’ve got it at last – the incentive being the Black Friday/Monday discount. 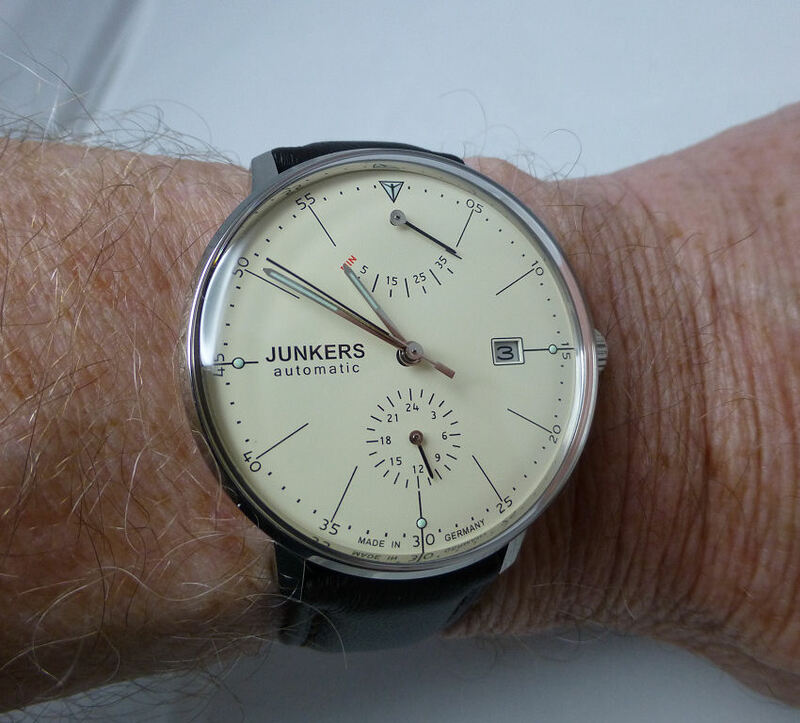 The Classic Junkers 6060M-5 Bauhaus. 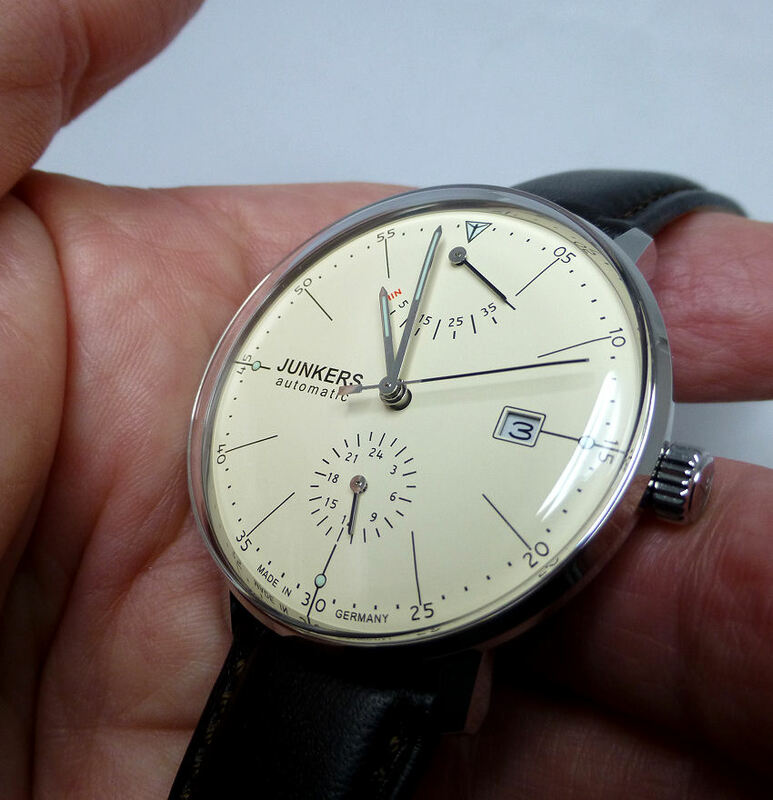 Time, Date, Power Reserve and 24 hr sub-dial from Junkers. Bauhaus bridging the gap between art and industry by combining crafts and fine arts, this model absolutely fits the bill for me. The Bauhaus movement began in Germany in 1919 and was a style template for great things in all walks of life and a fusion of the practical and the aesthetic. Here the concept is displayed in a rather stylish model and it has always attracted me and as I already love the Art Deco look, this suits my idea of what I want to wear. With a Stainless Steel 40 mm diameter case and around 11/12 mm height with a cream colored elegant dial, under a proprietary domed Hesalite crystal, this looks rather good. Personally I would have preferred the watch to be thinner, but saying that, it’s OK. And this is not the first model I’ve had with Hesalite crystal which is actually quite good, glare free and extremely shatterproof, though conversely soft enough to scratch. The upside is that any scratches you do pick up can easily be polished out (if not too deep). beating at 28,800 vibrations per hour with Date aperture @3 and a decent Power Reserve of over 40 hours. An ultra smooth running center sweep Seconds hand in black and a 24 hr sub-dial featured @6 with a Date aperture @3, plus a Power Reserve indicator @12. 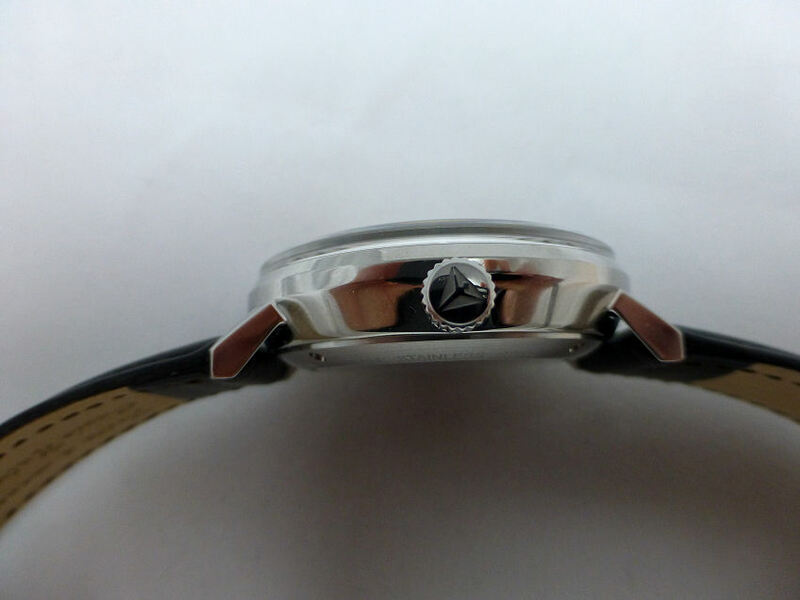 The Date is adjusted by the center crown and features hacking (the watch stops whilst the crown is out to the second position) so accurate time setting is easy. Dot markers at 3, 6 and 9, are green luminescent, as is the infill area on the small Logo @12. The fine gold colored stick Hour and Minute hands are also luminous filled. Overall the dial is as Classic as you can get. The modified Citizen movement is a good choice in my opinion and in my experience can be remarkably accurate. Some reports indicate the rotor can be noisy, but this particular movement is no better or worse than my other automatics. This model features an exhibition back through which you can see the silver textured rotor movement and gives that little bit of added interest. Chunky look accentuated by the Hesalite crystal. The watch appears to have a close resemblance to the Max Bill series that I also like n that it shares the elegant yet simple dial layout which is uncluttered and practical. The 20 mm strap is slightly thinner than my previous Junkers and is good quality, though it’s a close run thing regarding the holes available and my 170 mm wrist. As I like to wear my watches snug to the wrist I might yet punch another hole. Even with original strap this watch is comfortable (at 40 mm diameter it’s just about the ideal dimension for a watch in my opinion). The watch being rather chunky also looks a little larger than it really is once on the wrist. Due mostly to the height of the case and also owing to the quite thick and rounded Hesalite crystal, easily 2 mm above the case (my wife thought it rather like the icing on top of a cake). However I like the general look of the watch and pleased to see that the large Logo which is prominent on many Junkers, is replaced with the name only plus a smaller Junkers logo as a marker @12, which is very unobtrusive. With green luminous paint applied just to the Logo @12 and the dot markers @3, 6 and 9 plus the infill on the very slim hands you would be forgiven thinking the watch was not so good at night. And you could not be more wrong. I found I could still read the time in darkness some 5 hours later and this was managed without artifice. Watch sitting under my bedside light table while I got ready for bed – perhaps 10 minutes? In other words in a very normal situation. I was very impressed. As an automatic mechanical model the Citizen 9132 is very efficient and doesn’t take much wrist movement to wind it. Basically as soon as you put it on – it starts. If it’s been off the wrist for some time however it’s always a good thing to give it a wind or two with the crown to get it fully running. I’m pleased to say that I don’t hear it at all on the wrist and only when pressed against my ear and I also don’t feel the rotor moving in normal wear. 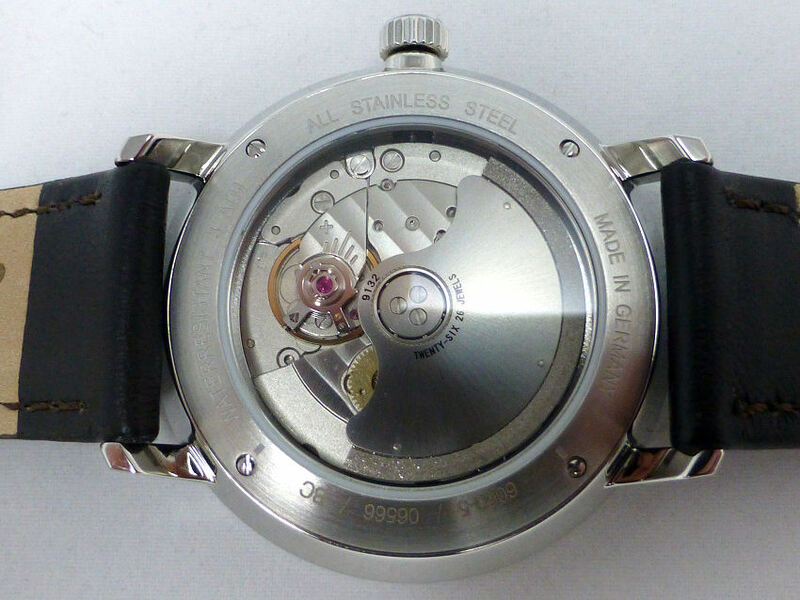 The movement itself via the exhibition back actually looks quite refined and not as utilitarian as they sometimes show. Accuracy – I’ll report on this after a few days against my Radio Control watches, though it appears so far to be very good indeed and as expected. As I guessed with the Miyota 9132 movement, it lives up to expectations for a movement that came out as an alternative to the Swiss ETA 2824 calibres. The Miyota 9100 series was introduced as an affordable alternative a while ago and as the Swiss maker ETA policy was to cease supplying movements/arts to all and sundry, somebody had to fill the vacuum – and very successfully too. As for time keeping this Junkers Miyota movement manages between 3 and 5 seconds (fast) per day and that’s straight out of the box. Unsure whether Pointec (Junkers Agency) have time adjusted it at all, but I’d say it’s easily as good practically as the old ETA 2824 and certainly in this limited complication. Can’t help but think ETA made a bit of a misjudgment ( could even be suicidal) with this Policy, as it was inevitable that the Asian/Japanese brands would step up to the plate and produce not only a movement to rival ETA, but at a fraction of the cost. In my view the customer benefits tremendously, certainly on new models. My sympathies go out to pre-owned collectors and existing owners regarding the cost of repair and replacement parts for original ETA movements. This entry was posted in Spotlight, Watch reviews and tagged Citizen 9132 movement, Junkers 6060-5, Junkers Bauhaus. Bookmark the permalink.